Week 33 of the 5th grade spelling program focuses on sight words, Greek root anti, and academic vocabulary. 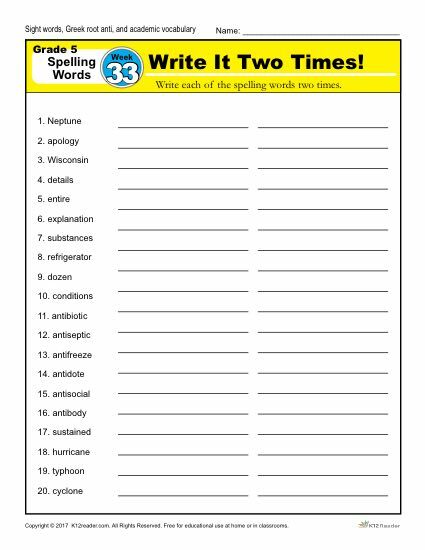 The spelling list for this week includes: Neptune, apology, Wisconsin, details, entire, explanation, substances, refrigerator, dozen, conditions, antibiotic, antiseptic, antifreeze, antidote, antisocial, antibody, sustained, hurricane, typhoon, and cyclone. Students will master the twenty spelling words through completion of 5 printable spelling worksheets: Write it Two Times, Dictation Sentences, Circle the Correct Spelling, Write a Sentence Part 1 and Write a Sentence Part 2. Click below to get started with week 33 of the free 36 week 5th grade spelling program! Find the master spelling words list by clicking here.